In December of this year, construction is slated to begin on a five-year, $40 billion project to create a shipping lane linking the Atlantic and Pacific oceans through Lake Nicaragua, also known as Lake Colcibolca. Concrete details about the initiative, which is reportedly being managed by an enigmatic Chinese businessman named Wang Jing, have been few and vague since its unveiling in July. Nicaraguan President Daniel Ortega has touted the potential economic benefits of the plan, telling Chinese state television in a recent interview that the canal would help safeguard his country from “global economic imperialism.” China, which has been expanding its economic ties with many countries in Latin America, also likely sees an advantage in having access to an alternative to the Panama Canal, which was under U.S. control for nearly a century until it was ceded to its close ally in 1999. 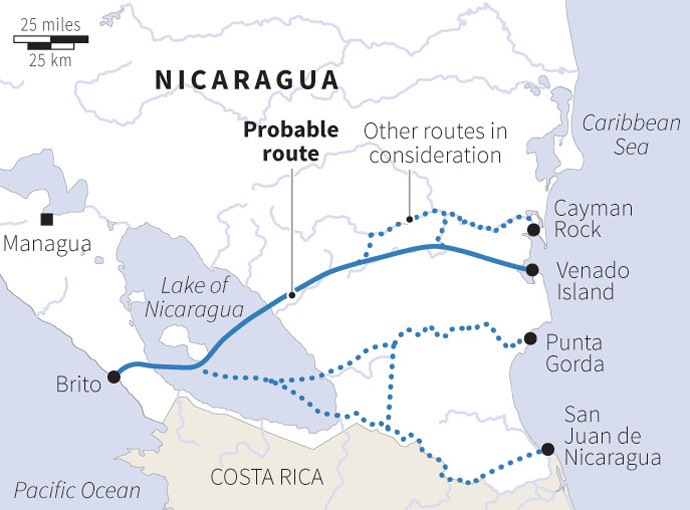 The Nicaragua Canal will have the capacity to accommodate larger vessels than the Panama Canal can, and if it is able to offer lower transportation costs than its southern competitor, Nicaragua could see increased traffic through its new waterway, along with an accompanying increase in revenue for the Nicaraguan government as well as the canal’s Chinese owners. Russia has extended an offer to provide security assistance to Nicaragua during the canal’s construction phase. Like Beijing, Moscow has an interest in lowering the costs of trading with Caribbean allies such as Venezuela and Cuba. But, Russia’s total trade with Latin America amounts to just a few billion dollars per year. For Russia, agreeing to provide security assistance for the canal’s construction is probably less about deepening overall economic ties with the region than it is about building upon its growing military relationship with many Latin American countries, especially Nicaragua. Policing the proposed waterway will require plenty of troops and equipment. No doubt Russia hopes to get an early foot in the door in terms of potential bilateral cooperation on training and arms sales. Moscow has provided security assistance to Nicaragua as far back as the 1980s, when the Soviet Union aided the Sandinista government in its fight against the U.S.-backed Contras. A recent military ceremony in Managua showed off equipment that was likely supplied by Russia, including armored personnel carriers and advanced anti-aircraft artillery. The Nicaraguan armed forces also recently announced plans to purchase an unspecified number of military aircraft and mentioned Russia as a possible source for the equipment. A number of political and civil society organizations in Nicaragua have publicly voiced their opposition to the planned canal and some observers have raised concerns about its potential environmental and social impacts. The LA Times reported that the “Nicaraguan Academy of Sciences calculated that nearly 1 million acres of tropical forest and wetlands could be destroyed” in the construction process. Some citizens have predicted it will forcibly displace many residents from their homes and communities without just compensation. Similar development projects have provoked militant resistance from many communities elsewhere in the Americas. President Ortega’s administration has moved toward centralizing authority over the country’s police forces in the executive office, which has prompted criticism from political opponents that the President was “politicizing” the police, and there are concerns his administration might try to use the police to suppress the voices of those opposed to the canal. In February 2013, police were accused of injuring dozens of demonstrators in an attempt to repress a protest against the Canadian mining giant B2 Gold. Nevertheless, the United States Southern Command recently pledged $4 million to the Nicaraguan navy to help with anti-drug operations. The U.S. has also allocated Nicaragua about $5 million in military and police aid each year since 2012, the vast majority of which falls under the counter-narcotics assistance programs administered by the Department of Defense known as Section 1004 and Section 1033. While the U.S. seems primarily concerned with attempting to disrupt the activities of criminal organizations and the flow of drugs through Central America, Russia and China likely care much less about smugglers transporting their products to the United States. China wants the canal built, largely for economic reasons, and Russia is more than willing to provide assistance on security matters, especially if the payoff includes diplomatic support in international forums on issues such as Ukraine, Syria, and Iran. The cooperation goes both ways. In November 2013, the Nicaraguan parliament voted to authorize Russian and U.S. military forces to perform anti-narcotics operations within its newly expanded maritime jurisdiction. The waters in question had been awarded to Nicaragua a year earlier by the International Court of Justice after a dispute with Colombia that was decided in favor of the former. According to the BBC, “[t]he decision potentially gives Nicaragua more access to fishing grounds, as well as reported underwater oil and gas deposits.” Although Colombia has refused to recognize the ruling, Russia appears to have recognized Nicaragua’s claim by default, as it provided intelligence in an April 2013 drug bust in the area. There are complex geopolitical factors at play here, but the bottom line seems to be that Nicaragua is pursuing an independent foreign policy aimed at promoting security and development at home. This independence has come at the price of entangling alliances and a tolerance for corruption, but thus far the Ortega administration has proven adept at handling the diplomatic complexities. As Foreign Policy wrote last year, “[Ortega’s] actions to date suggest he is politically authoritarian, economically pro-business, socially populist – and, above all else, pragmatic.” The United States and China are two of the Nicaragua’s top trading partners, and the country has a deepening and important security relationship with Russia. The canal’s construction likely will not change the status quo. In fact, it might serve to strengthen it.